Do you sit long hours in front of a screen? Do you feel your neck and your back are sore after looking at a screen for such a long time? Do you fear your laptop will overheat, and last less? This Megainvo artistic ventilated Laptop Stand will be the right product for you. Its simple Design and ergonomic adjustable height allows for an optimal visual angle and gives your laptop the space it needs for the air to go through to keep it cool. The Desktop Stand has a Triangular structure and is made of high quality aluminium, which keeps your Laptop stable. It fits all laptops, tablets and smartphones, and bears up to 15 kg. Lightweight and foldable design enable you to take it to office, at home or travelling. Tablet: iPad, Samsung Tablet and other tablets. ALUMINIUM ADJUSTABLE LAPTOP STAND - Adjustable laptop stand, lifts your laptop between 12cm and 20cm, and it brings your MacBook/Laptop screen to eye level, optimising your posture and preventing neck pain and eye stress. The stand is ventilated, hence preventing laptops from overheating and crashes. UNIQUE DESIGN - Tablet Stand features a "Hollow out" design for fast heat dissipation; its advanced closing and opening mechanism makes it easy to use, and its Big-Small stops allow all laptop thicknesses to be fixed to the Stand. 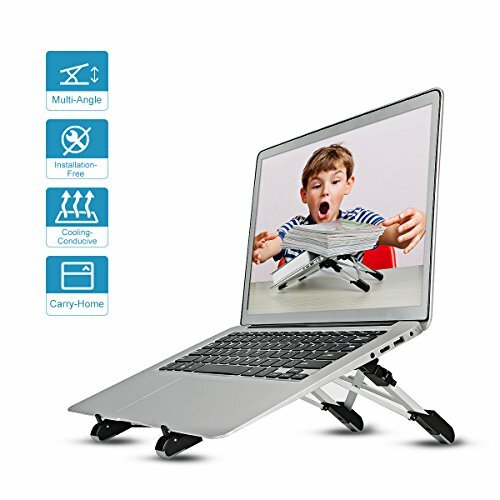 STABLE AND DURABLE STAND - The triangular structure and high quality lightweight aluminium material of the Laptop Stand makes it a stable, durable and resistant product, supporting 15 kg maximum weight. TRAVEL LIGHT, TRAVEL RIGHT - The foldable and portable design of the Stand is perfect for all type of travels, from leisure to business. The stand is light and can be easily stored in suitcases, backpacks and even handbags, and it suits most devices. One Stand will suit your Laptop, Cell Phone and Ipad and much more! If you have any questions about this product by Megainvo, contact us by completing and submitting the form below. If you are looking for a specif part number, please include it with your message.